The 2nd offering from Bruchladdich for this Port Charlotte-centeric Feis Ile 2018, is yet another PC. Unlike the Valinch, this is not a single cask, but a mix of a few types of whisky casks : or more precisely a marriage of the last five casks filled during the first year of Bruichladdich’s Port Charlotte production in 2001, which is why they named it ‘The Last of the First.‘. The casks used to age this expression had previously held American whiskey, rum, and French wine. A mix of some wine casks, Rum and ex-bourbon sounds a bit like another “Black Arts” sort of concoction, and as you know I am not a fan of the Black Arts series… hopefully this will turn out better, and the wine casks will not affect it too much. lactic feel to it, starting with sweet condensed milk, some green olive brine, quite dirty with some motor oil, pepper, there’s also some hint of wine , capers, smoke and medicinal (TCP) touches with a slightly sour touch, good feeling all in all – this is a bold dram indeed. Quite surprising all those different casks work well together. 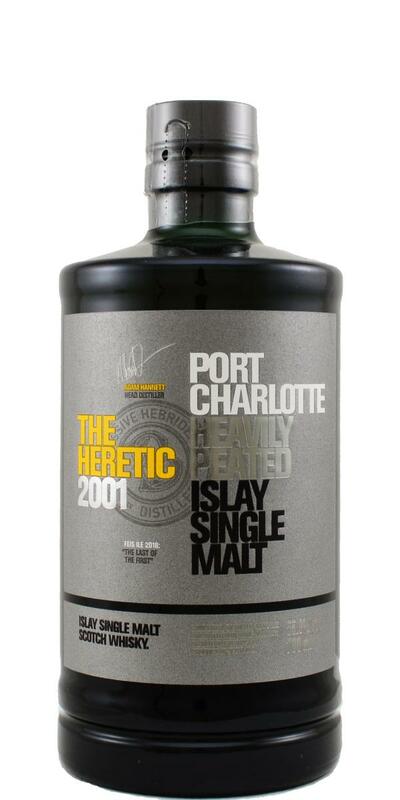 Palate: Ashy, and sooty with the right amount of medicinal notes, on top of sweet nutty, cereals, a touch of vanilla as well probably from the ex-bourbon component… salty, and tarry as well, developing into dry , bitter territories, the smoke and seaweed go a long way. The wine notes are not strong at all , which is a good surprise in my book.. This is an excellent Port Charlotte, bold and powerful with the right amount of ash, peat, tar and medicinal goodness, showing some lactic notes , but really well integrated. Happily I can say the red wine and rum influences are not overpowering, and it’s surprisingly good, for such a mix of casks.Slightly better than the Valinch.